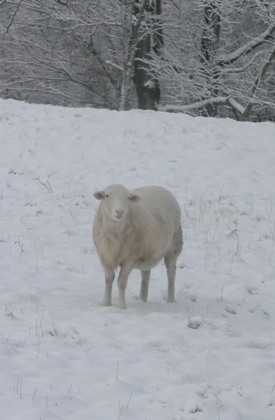 On the first day of March, we awoke to a blanket of snow over our farm. It snowed last year in March as well…that seems to be a common trend here. Snow is so blinding bright and white…and wonderful. It makes the noisy world around stand still. Ok, well, the farm was still noisy with roosters crowing, sheep baaing and goats maaing and one unmentioned animal screaming…literally. 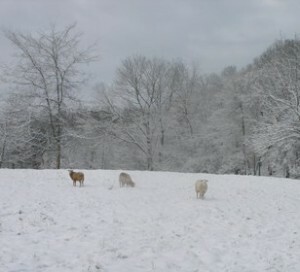 But it was a beautiful sight to behold…the snow…not the screaming goat. wow- we got just a few snow flurries to make a dusting. Thankfully. Although snow can look pretty at times, like in your pictures, I’m a Spring Gal. I don’t like cold, snow or winter much. I also like the pictures of the chick eggs. I hope they do well for you. I guess it would be touch and go for a while.